For over 15 years, Coffeeberries has been serving delicious, gourmet coffee, tea and treats in an atmosphere as warm and inviting as its signature brews. Located off of Route 102 in the Apple Tree Mall, Coffeeberries is conveniently located right in the heart of Londonderry. Locally owned and operated, we pride ourselves on supporting local businesses and getting to know our customers by name and, of course, by brew. Owner Christine, seeks out the best of New England for our loyal customers, including products from New Hampshire coffee roasters such as Woodshed Roasting and Mill City Roasting, Harvest Thyme Herbs, and Cupcakes 101 as well as quality products from nationally known and loved gourmet producers such as Stonewall Kitchen and Rothschild Farm. Whether you're looking to kick back and relax with a specialty coffee, stock up on your favorite snacks or find unique and delicious gift items, you'll always find what you're looking for at Coffeeberries. 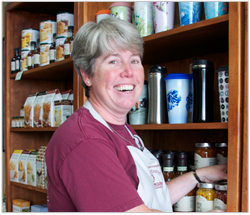 A Coffeeberries’ regular and Mocha Blast drinker for years, Christine Adie has owned the store since January 2006. As mother to four active children, she may not always be behind the counter, but you can be sure she has a hand in the selection of each and every item we carry. Christine especially likes the taste testing part of her job where she gets to sample the best of locally produced gourmet treats and beverages and meet the incredibly talented people who produce them. Coffeeberries’ is proud to have launched the careers of many a young, local barista. And just like family, you’ll often see many of these familiar faces return to Coffeeberries on their college vacations. Virginia was the smiling face behind the counter providing the warm reception and quality service for which we're known every weekday morning for more than a decade. She retired at the end of July and now Christine is in the shop early to help get your day started on the right foot. Stop in and say hello. Oh, and don't forget to treat yourself with something delicious, you deserve it!